Brief Synopsis – Three brothers adopted by a wealthy family join the French Foreign Legions after a precious family heirloom goes missing. My Take on it – This is a film that I knew absolutely nothing about and was quite confused about the title before seeing what it was all about. They do an amazing job showing the lengths some people will go to defend family honor and also to keep a string brotherly and familial bond no matter what. The cast is superb with Gary Cooper, Ray Milland and (an extremely young) Robert Preston playing the trio of brothers. We can easily feel the love that they have for one another and understand that they will each do just about anything to help the others if the situation arises. Loved the way that the first scene makes very little sense until we learn the whole story via flashback. 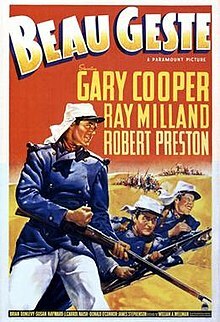 Brian Donlevy was nominated for an Oscar for Best Supporting Actor for his very brutal portrayal of the legionnaire sergeant who must find a way to keep his troops together when they find themselves in a very dire and dangerous situation. Bottom Line – Great story about brotherly and familial love that works on numerous levels. The cast is great with Cooper, Milland and (a very young) Preston all giving great performances. The story is told really well in flashback after the first scene makes little sense until you know the background of it all. We can easily feel the connection between these brothers and know that they will each do whatever it takes to help out the others in the time of need. Donlevy was nominated for an Oscar for Best Supporting Actor for his very brutal performance as the legionnaire commander who must keep his troops together under very dire circumstances. Recommended! Beau, Digby and John Geste. This was a movie I saw on TV as a kid when it was on the Million Dollar Movie – which ran on WOR in NYC and would show one movie in the afternoons – every day for a week. So my brothers and I (I have 2 brothers, so maybe it resonated with me for that reason) watched it 8 or 9 times in a week. Had it pretty much memorized. It has remained one of my movie favorites.The remake (after the ’39 version) was not very good and the spoof version even worse. This was a classic – with some vry good (and as you said – very young) actors – most of whom would go on to win Oscars (Cooper, 2 – Milland 1 and Susan Hayward 1 as well) It even got me to read the novel when I was older – and my main disappointment was that the last line of the film – which I love (“Beau Geste, gallant gesture. We named him well, didn’t we John…”) is in the film but NOT the novel.